Carol has been an orthopedic and sports medicine physical therapist since 1986, when she completed her degree in physical therapy at the University of Miami. For 8 years, she directed a thriving sports medicine facility in Northern Virginia, specializing in treating ACL (knee) reconstructions, total knee and hip replacements, herniated discs, fractures, sprains/strains, muscle imbalances, and many other diagnoses in the human population. Successfully treating and managing her Golden Retriever, Rodan’s, hip dysplasia without surgery, since puppyhood, inspired her to apply her expertise in anatomy to the pet population. Carol attended specialized courses at the University of Tennessee’s Canine Physical Therapy program, in addition to many other courses across the country. Carol started Pet Rehab in 2000 and has since worked on dogs and cats with such diagnoses as ACL/CCL (knee) tears and repairs, hip dysplasia, hernias, brain tumors, obesity, elbow dysplasia, fractures, seizures, disc disease, rotator cuff injuries, Achilles tendon tears and repairs, sprains and strains. Carol helps dogs maintain and regain their strength and range of motion following TPLOs (tibeal plateau leveling osteotomy) and FHOs (femoral head osteomoty) surgeries. She will design a customized program to achieve the best treatment for your pet. Treatments can be developed to either avoid invasive or unnecessary surgeries, to alleviate the common aches and pains of the aging pet, or to aid in post-surgical recovery. Pet Rehab provides specialized programs for working dogs, such as those on local police forces, as well as dogs competing in agility and other events. Agility training increases awareness and balance for non-competitive dogs, allows working dogs to return to work more quickly, and prepares competitive animals to return to their sport after injury. Some Pet Rehab clients continue weekly treatments to improve the overall fitness of their pet. Tanya has been a licensed Physical Therapist Assistant since 1994 with 20+ years of experience in sports and orthopedic rehabilitation. She has developed and directed several aquatic therapy programs, developed specialized therapist teams, been a member of an outcomes study research team, managed a staff of LPTAs, been a clinical instructor for physical therapist assistant students for over 19 years, and holds various certifications. Tanya’s work environments have included corporate and private outpatient clinics, skilled nursing facilities, and private residences. She enjoys working with individuals of all ages and physical abilities, and is now enjoying working with dogs of all ages and physical abilities. Carol and Tanya first started working together in early 1999, in a busy outpatient sports medicine clinic, prior to the opening of Pet Rehab. In 2008, Tanya called on Carol when her dog Harley, a chocolate Labrador, was in need of a hip replacement. It was then that Tanya realized her excitement in being able to rehab her dog, much like her human patients. 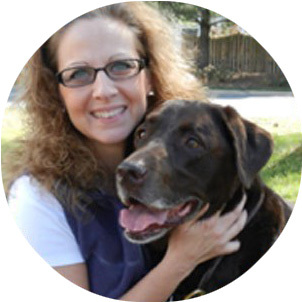 Tanya started with Pet Rehab as a volunteer in 2009, occasionally assisting Carol with her patient treatments. After starting her training at the University of Tennessee in 2010, to become a Certified Canine Rehabilitation Practitioner, she became an employee of Pet Rehab. Tanya completed her certification in 2012 and has been seeing patients at VCA SouthPaws Veterinary Specialists & Emergency Center, as well as occasional home visits. Carol and Tanya are a successful and dynamic team and are well received by their patients and clients. Together they provide exceptional and compassionate care for your pet and instruct you, the pet owner, how to care for your pet during rehabilitation and how to reduce the risk of re-injury at home. They design individualized exercise programs and plans of care unique to Pet Rehab, based on your pet’s needs and physical abilities.